In addition to being unwanted pests, roaches spread disease. They can carry bacteria that cause food poisoning, vomiting, diarrhea and other illness. Many people are extremely sensitive to allergens which are contained in cockroach excrement and cast skins. Those individuals may experience skin rashes, watery eyes and sneezing. Even Asthma has been attributed to, and can be aggravated by, exposure to these allergens. The 3 most common cockroaches found in homes are German, Oriental and American. The German cockroach is the most common indoor species, especially in multiple-family dwellings. Although it has a short life cycle of three to eight months, it reproduces the fastest: a single female and her offspring can produce over 30,000 individuals in a year. 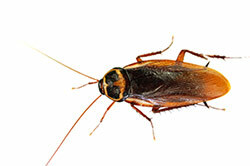 The German cockroach prefers food preparation and storage areas, kitchens, and bathrooms because they favor warm, humid areas that are close to food and water. Oriental and American cockroaches, also known as waterbugs, can be found in dark, moist areas where there is filth or decaying organic matter both indoors and out. They are most often found in basements, crawl spaces, floor drains and sewers.